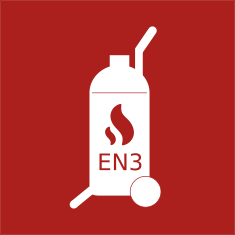 Steel AISI 304 fire extinguisher pressure vessels manufactured in compliance with European Pressure Equipment Directive 2014/68/EU (PED) and according to European Standards EN 3-7 and EN 3-8. Stainless steel cylindrical pressure vessels suitable for realizing hand-held and cart-mounted fire extinguishers that can be filled with powder, foam or CO2. 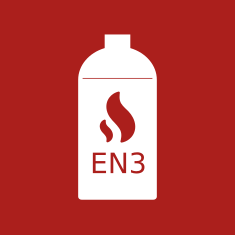 The type of metal together with welding and finishing quality, make these items ideal for the production of light-weighted, non-magnetic, long-lasting fire extinguishers. Besides being more resistant and lighter compared to traditional models, fire extinguisher cylinders made in austenitic stainless steel are non-magnetic. Cylindrical pressure vessels for hand portable fire extinguishers. Capacity: 2, 6, 9, 12 Kg. Manufactured to comply with the European Pressure Equipment Directive (PED). Structural design and welding process are carried out in accordance with European Standards EN 3-7, then each vessel is tested to meet EN 3-8 Standards. These items are supplied in standard red finish (RAL3000), they can be embellished with shiny steel finishing on request. Cylindrical pressure vessels for wheeled fire extinguishers. Capacity: 30 and 50 kg. Custom-designed vessels and tanks for remote controlled fire extinguishers and automatic fire suppression systems.